The latest iRacing build is arriving today, with the FW31 arriving a few hours following the build deployment itself. Following the footsteps of recent builds iRacing have kindly provided the release notes ahead of time. - Introducing the 2009 AT&T Williams FW31. - This is the first car for which we have written a setup guide, located within the Instruction area of the website. - 3 downforce trims are available. - Front flap angle and rear wing wicker can be altered for aero balance adjustments. - Front suspension has corner springs, anti-roll bar, and heave spring. - Rear suspension has heave spring and anti-roll bar only. - Vehicle has 6 dampers: 4 corner dampers, and 2 heave dampers. - Brake pressure and dynamic brake bias are available to adjust. 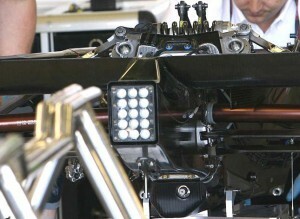 - While in pit-box and in neutral dynamic brake balance is shown on display. - Front and rear inerter masses are adjustable. - In-car adjustments are brake bias, three diff settings, engine braking, engine power and throttle pedal response. - Pit stop adjustments include front flap angle. A lot of the items are straightforward and have been used in other iRacing cars previously. There are a few setup parameters that are new to iRacing and are sure to cause some head scratching initially. One of the parameters involves the inerter adjustment. The inerter first appeared in F1 in 2005 but it has taken a few years for their secrets to really become known (it seems until 2008 no reliable knowledge was in the public domain). As we prepare to get truly confused with building FW31 setups here’s a useful guide to how inerters (originally called ‘j-dampers’ by McLaren) can be used in an F1 setup. If someone wants to really get into the task of building and tuning iRacing F1 setups, then they’ll need to have a solid understanding of how these work. Another major new setup option is the 3rd spring (or ‘heave’ spring). When I find a similar resource for the heave springs I’ll update this post. iRacing release their new build today (it’s out now) and one of the key talking points is the addition of a serious transmission model. No longer will we be able to slamshift into gears with perfect results! I find that I can understand how things work much better when I can get a visual reference for what is going on. I only had a very rough idea for how a gearbox works so I spent the morning seeking some good visual representations for what goes on when you try and force a gear change in various gearboxes. This link is the best one I’ve found so far – posting here as a permanent reminder for myself as I’ll definitely revisit it again and again!